In life we all behave differently and have different aspirations. As long as harm is not being done to others then this is ok and is what keeps the place interesting. This means that there will be people who have opted out of consumerism and are practising limited frugality such as myself (and many readers) and people who are consuming either through choice or because they are just not aware of the alternatives. That’s ok. 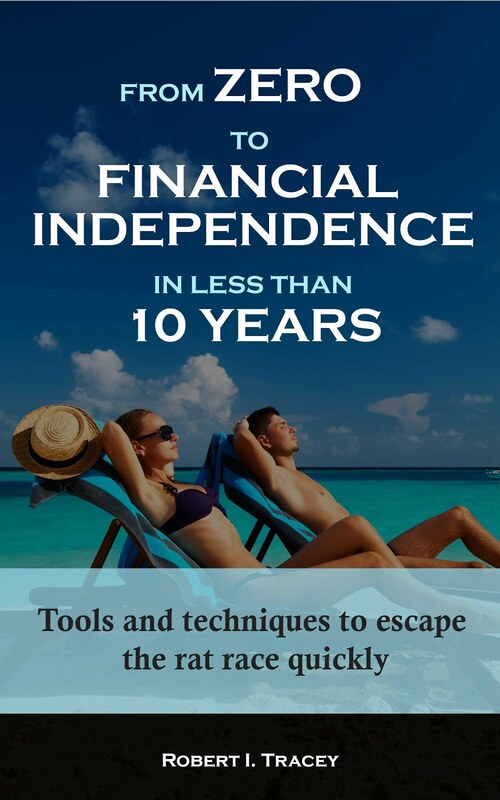 There will also be people like myself (and many readers) who have personal finance as a hobby and others who either have no interest in the subject or struggle with too much mathematical complexity. That’s ok also. I sometimes wonder what those of the opposite persuasion must think when they stumble across Retirement Investing Today via Google or other website link. I can’t help but wonder if we might be perceived as a little extreme and also guilty of making personal finance topics unnecessarily complicated. For this post I therefore want to take a step back and not be either extreme or complex to hopefully help many. A Million Pounds is a lot of wealth to all but a very few. It is also a very emotive value. Could anybody who was prepared to apply themselves in life, but not be as extreme (maybe they gain happiness from things or want more work/life balance or...) and analytical as we are on this blog ever accrue a million pounds? 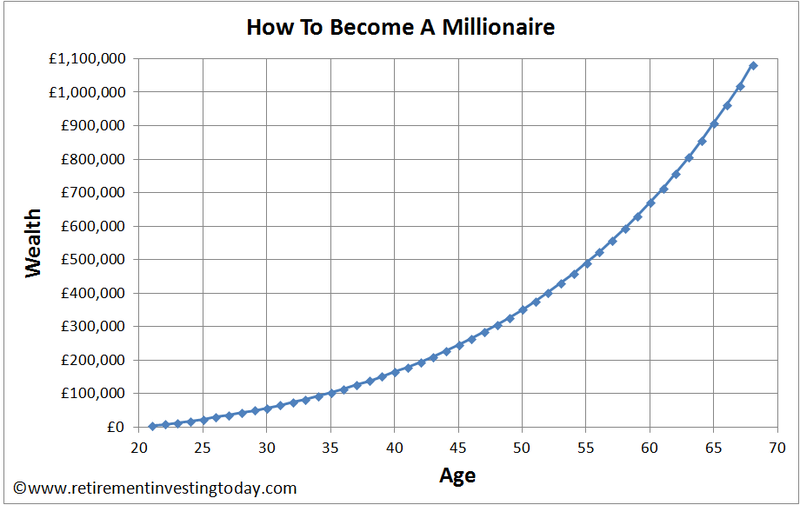 Let’s try and develop a simple model to demonstrate if an Average Joe could become a Millionaire. Let’s define our Average Joe. I’m going to assume our Joe is not an “Average Earner” but instead intends to pursue a “profession” which will start on a salary of £20,000 at age 21 and finish on a salary of £40,000 at age 68 (State Pension Age for today’s young), for an average lifetime earnings of £30,000. I can think of many arts, sciences or technical university/apprenticeship routes that would enable this level of attainment through persistence. Our Average Joe also doesn’t aspire to the 60% savings rates that I do but does realise its important and so religiously saves 20% of earnings every month leaving plenty of cash for consumption today. Only two funds will ever be bought. To prevent fund expenses placing a drag on portfolio performance these will be the low expense Vanguard FTSE100 ETF with a TER of 0.1% and the Vanguard UK Government Bond ETF with a TER of 0.12%. Tim Hale, who incidentally has just published the 3rd edition of his excellent book Smarter Investing : Simpler Decisions for Better Results , teaches us that historically UK Equities have on average returned 7.3% less expenses in Real terms and UK Bonds have returned 2.3% less expenses. These ETF’s will be held within a TD Direct Investing Stocks and Shares TD Trading ISA to ensure taxes, which again place a drag on portfolio performance, are minimised. Our Average Joe will target to hold his age as a percentage in the Bond ETF with the remainder in the FTSE100 ETF. So if he’s 23 he will target 23% in Bonds and 67% in Equities. Once he gets to age 40 he'll stay with 40% Bonds and 60% Equities forever more. He will buy a further allocation of one of the ETF’s every quarter. If he has less than his age in bonds then that will be the bond ETF and if he has more than his age in bonds then it will be the FTSE100 ETF. This will cost him £50 per annum in trading expenses if using the TD Trading ISA. Every year on his birthday our Average Joe will look at how far away from his age in bonds he is. If he’s not between Age-5 and Age+5 percent then he will sell the fund that is overweight and buy the fund that is underweight. This could add an additional £25 per annum in trading expenses. Then he just stays the course and goes fishing or shopping depending on level of consumption required to make for a fulfilling life. So does our Average Joe become a Millionaire? In short yes. It takes a while but Compound Interest eventually starts to accelerate his wealth and he makes it just after his 67th birthday. His path is shown in the table and chart below. This post is very simplistic in its approach. It is not meant to be a definitive guide to investing but it does demonstrate that even an Average Investor can accrue a lot of wealth in a lifetime if he stays the course and focuses on minimising expenses and taxes. Is our Average Joe guaranteed to accrue a million by 67? Of course not but I’d be willing to bet it’s going to be a very significant sum. To keep the post simple I haven’t considered extended diversification or counter party risk (amongst many other things like the need for Emergency Funds) both of which are likely to become important as the wealth accrued starts to become significant. All calculations are done in today’s £’s, not tomorrow’s devalued by inflation pounds. This means the million pounds at age 67 is the equivalent of a million pounds today. Thanks RIT, I'd be interested to see the impact of increasing the savings rate. My hunch is that Joe would only need to up it to around 25%-30% and he could retire early with his million. I definitely would not advocate any allocation to bonds in his 20s and 30s (or even 40s). I imagine the outcome would be dramatically different if you were to rejig the figures with 100% equities for the first 20 years - may become a millionaire in his 40s. Interesting viewpoint. It would be interesting to run an analysis that looked at the historic returns that could have been achieved from 100% Equities vs Age in Bonds strategies. Does the "free lunch" that potentially comes from the correlation differences between the two asset classes beat/lose out against the expected extra return that historically comes from equities over bonds. Have you ever seen any research on this? Might be time to hit Google on this one. Well worth a read for those investors looking at longer term asset allocation. The best I can extrapolate is a likely 5% extra annualised return on equities v bonds - of course, this comes with extra volatility. The Yearbook says you can reasonably expect a real 3% p.a. from equities and 0% p.a. from bonds and cash. Su suppose you went for annual rebalancing of 80% equities and 20% bonds. On the face of it that yields 2.4% p.a. real. But if the extra return from "volatility harvesting" exceeds 0.6% p.a. (not a big ask, I suspect) you're going to get a higher return than with 100% equity, and get it with less volatility. Put another way: if you don't have 20% in bonds or cash, with what are you going to pile into equities after a crash? "Tim Hale … teaches us that on average UK Equities should return 7.3% less expenses in Real terms and UK Bonds should return 2.3% less expenses." What's "should" got to do with it? Credit Suisse reckons that over the next 20-30 years you can reasonably expect a real 3% p.a. from equities and 0% p.a. from bonds and cash. Thanks for picking me up on this. Poor wording on my behalf which has been duly corrected in the post. If your Credit Suisse reference proves correct there could be a lot of retirees running drawdown portfolios starting to get a little nervous in a few years time. 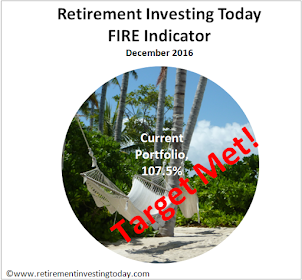 This is why it is so important for everyone, not just retirees, to examine their consumption footprint and reduce it where they can. If you can reduce your annual expenses by 25% then your money will last 33% more. As the demographic tsunami strikes right across the world - including countries like China - and people live longer lives, this will be essential to avoid retirement and old age being equivalent to abject poverty for many people. The days of retirees expecting "beer and skittles" are gone, due to lower expected future returns, longer expected life spans, and reduced Governmentncapability to sustain social security benefits given deficits. I may not have been as clear as I could have been in the post but the whole analysis has been conducted in real terms. The effects of inflation have been removed. ie £1 when Average Joe is 21 has the same purchasing power as when he is 68. I see what you mean RIT. Plus in real life you'd expect wages to keep (roughly) inline with inflation, so our Average Joe will be able to continue to find the money to save and invest so he can keep on the same route to that 'million-or-equivalent' no matter what stage he's at. I think you're right to keep inflation out of it to make your point and allow for a straight start to end comparison. Good work. 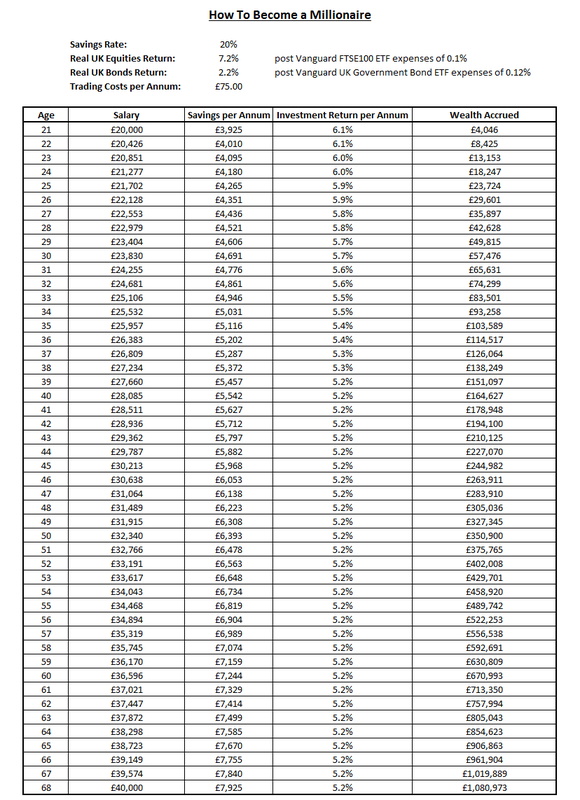 Well, £1,000,000 at retirement would be TWENTY times the assumes final salary, so even if your spending was the same post-retirement as pre-retirement, that would be twenty years without the pension. With wise investing and careful attention tomtaxesmetc that is more like 25 years. If only someone had convinced me to save instead of take on a car loan at that age... I agree it would have been a difficult discussion and I honestly couldn't say if I would have been convinced. I suspect not unless it was a very persuasive person. In reality, young people would not be saving for their pension but getting a car, saving for a deposit, getting marring and only then in 30th would start thinking about contributions. And I think this is ok. I just ran a simplified version of the simulation, investing just once a year, omitting charges, not rebalancing, but retaining the target allocation ratio. I came out with a very similar answer of £1.09M at age 68. The interesting point I wanted to make is that after the age of 36, Joe has to buy bonds every time, to keep their value up with the higher-returning equities. I thought it was a mistake at first, but that's what the numbers say. Did your more detailed simulation have the same behaviour? The big thing missing from this is volatility, which is the only reason for investing in the lower-yielding bonds in the first place. Bonds aren't the only way to deal with the volatility and uncertainty of growth oriented assets like equities, but they are usually quite effective. This is especially true when the underlying cause is a growth/deflation shock. Unfortunately the low level of Fovernment bond yields right now suggests investors might have to give up a lot of potential return in order to get this extra "protection" from bonds (and if you believe in the possibility of future inflation due to excessively loose monetary policy then bonds could be a VERY expensive insurance policy). Other ways to deal with the problem include capturing different risk premia within equities markets (value, momentum, quality, yield etc), diversification across growth asset classes, the use of direct insurance (e.g. Options contracts), seeking active returns, the use of leverage, holding cash to cover 2-5 years of retirement spending up-front, and so on. None are perfect or cost-free, but to rely only on one form of risk management is, itself, a risk. I know it's just to illustrate what can be achieved, but just wanted to add that as only the first £50,000 of stocks/bonds are 'safe' in any UK financial institution, it would be best if Joe spread his investments around 20 or more different brokers to mininise the heartache of achieving such wealth only to see it disappear if TD Direct or whoever went down the pan! There isn't an issue of "safety" for stocks or bonds - you own them, not the broker you happen to have bought them through!? There might be a degree of administrative pain (but even that's unlikely) but ohterwise the risk is of the company you won going bust, not a broker. It's only cash where it does sit on your invested company's balance sheet that it's an issue. The money you invest through a broker e.g. TDW gives you shares in a company e.g. Vodafone. If TDW goes bust they are not allowed to appropriate your shares, they belong to you. If Vodafone goes bust then you are in trouble. Nice simple example. That graph is great at demonstrating the power of compounding in the long term. The tricky part for may is having the consistency and patience to wait for the gradient of that line to steepen!